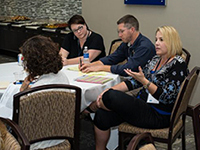 Psychological science teachers from the high school level to the university level met in April 2015 at Embry-Riddle Aeronautical University in Daytona Beach to trade educational tips and best practices with one another. 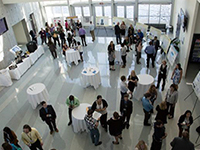 The networking workshop and luncheon, held in conjunction with the Human Factors and Applied Psychology Student Research Conference, was supported by the APS Fund for Teaching and Public Understanding of Psychological Science. The workshop featured four speakers who highlighted exceptional teaching practices for applied psychology, including methods for teaching students to apply psychology as well as for applying motivational principles and best practices in the classroom. All participants were mailed a compilation CD of presentation materials as a resource for future course development. The event was organized by Amy Bradshaw Hoppock, who can be contacted at bradse11@erau.edu, and Christina Frederick, who can be contacted at frederic@erau.edu. Both are professors in the Human Factors Department at Embry-Riddle Aeronautical University.